STAVAGNER, NORWAY: Current US sanctions on Iran are unlikely to stop Iranian oil exports completely, a long-time adviser at Saudi Arabia’s Energy Ministry said on Tuesday, adding Iran would be unable to close the straits of Hormuz and Bab Al-Mandab even partially. 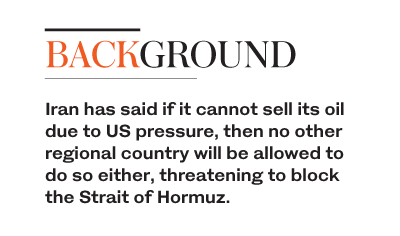 Iran has said if it cannot sell its oil due to US pressure, then no other regional country will be allowed to do so either, threatening to block the Strait of Hormuz. He said if Iran closes Strait of Hormuz, the UN Security Council is likely to authorize military action. Earlier on Monday, Iran went to the UN highest court in a bid to have US sanctions lifted, calling the US move "naked economic aggression." Iran filed the case with the International Court of Justice in July, claiming that sanctions the Trump administration imposed on May 8 breach a 1955 bilateral agreement known as the Treaty of Amity that regulates economic and consular ties between the two countries. At hearings at The Hague, Tehran asked judges at the world court to urgently suspend the sanctions to protect Iranian interests while the case challenging their legality is being heard — a process that can take years. US Secretary of State Mike Pompeo called the legal move an attempt by Tehran "to interfere with the sovereign rights of the US to take lawful actions, including re-imposition of sanctions. US President Donald Trump pulled out of a 2015 pact between Iran and major world powers under which sanctions were lifted in return for Tehran accepting curbs on its nuclear program. The Trump administration then announced unilateral plans to restore sanctions against Tehran.